Titles of books seem to get longer and longer - no doubt in order to maximise search engine keyword recognition. 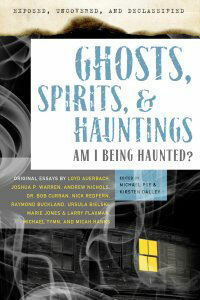 The title of this book about ghost-hunting takes some beating, especially with the long list of contributing authors: Loyd Auerbach, Nick Redfern, Joshua P. Warren, Andrew Nichols, Bob Curran, Raymond Buckland, Ursula Bielski, Marie D. Jones, Larry Flaxman, Michael Tymn & Micah Hanks. The sub-title "Am I being Haunted?" is not as relevant as it might be - the book is really aimed at amateur ghost-hunters who are drawn to this pleasant nocturnal past-time by the various TV specials that have popularised the subject in recent years. Given that I count myself among that number, I found the contents of the book very helpful indeed. Indeed, the format of the book is useful in itself, because the diversity of opinion and approach on display is relevant to a field pock-marked with strong opinions and dogmas. Science, religion, parapsychology, spiritualism, shamanism, and amateur sleuthing all have their parts to play - even Nick Redfern's phantom creatures seem appropriate among the mix. The balance to this person-centred approach is provided by Larry Flaxman who sets out his stall for a more physics-based approach to ghost-hunting. Although sceptical about the efficacy of EMF gadgets, he nonetheless deploys an array of instrumentation in his fastidious investigations of chosts in Arkansas. His passion for the science is not in doubt, but one is left hoping for a few ghost stories to lighten things up (or is that darken things down?). Bob Curran does not disappoint, with his colourful tales about poltergeists, and neither does Ursula Bielski's essay on the phantom hitchhikers of Chicago. Perhaps more exciting for the ghost-sleuths is Joshua Warren's analysis of some remarkable ghost photos taken at American Civil War battlefields. Digital cameras have provided a wealth of data in the last couple of decades, particularly of orbs (which strangely enough don't feature in the book at all, for good or ill). Warren argues that digital cameras pick up a certain amount of infra-red radiation (should my oven have an aura then? ), and experiments with electromagnetic fields by his team have produced some interesting effects, reproduced in the book. But my favourite essays stem from the authors more inclined towards spiritualism, like Michael Tymn. His treatise on the moderate planes of existence in the afterlife have a distinctly pre-Christian feel to them - the grey pagan realms of lost spirits who often don't realise they're even dead. The Buddhists call these spirits the pretas, or unhappy ghosts, who hang around their houses after death confused as to what they should do next. When I've attended events held by mediums, like Derek Acorah, Im often struck by how prosaic the discussions emanating from the afterlife are: "I don't like the new colour in the living room." "Don't forget to feed the hamster". Where's the awed descriptions of the spirit's first encounter with God, or the heavenly host? Curiously absent. I think the most controversial essay in the book is by Micah Hanks. He argues that some psychiatric practitioners are entertaining the idea that some of their disturbed patients, particularly some schizophrenics, are being influenced by an attached spirit. In my own professional work as a general nurse, I've come across this same thing, albeit rarely. The problem is that however convincing the mediumistic ability of the patient may be, and however disturbing their experiences with ghosts in the hospital (which are presumably legion, and likely unpleasant) one cannot step back to a pre-Enlightenment approach to mental health care. On a logical level it might appeal (if spirits 'exist' and are disturbing a patient, then telling them to bugger off to the light seems a simple solution), but before we know it we'll be back to the dark old days of accusing disturbed people of witchcraft, sorcery and so on. And that is a very dark road to tread indeed. We should ask ourselves this: How would our modern culture change if science actually proved the existence of spirits interacting with us from beyond? Personally, I'd be more anxious about the popular reaction to that than the present 'entertainment' value of the subject, so derided in these pages. Subtitled "Am I Being Haunted?"